Unix is an incredibly well-designed operating system. After all, it cannot be a coincidence that not only Linux distros but Mac OS X also runs on it. Unix comes with excellent security features, customizable file permissions are one of them. Unix file permissions allow you to define who can read, write, and execute each file on your system. If you have a WordPress site or use a Linux server with another type of site you will find this tutorial useful. Web hosts usually allow users to change Unix file permissions from their cPanel so that they can achieve extra security by protecting vulnerable files and directories at the root level. The most important thing you need to know is that Unix treats everything as a file. Not only files but directories and devices are also files on a Unix system. Unix assigns three types of owners to each file: User, Group, and Other. To configure your file permissions, you need to decide which rights you want to grant to each of those owners. The User is the person who created the given file. Anyone who creates a new file in a Unix system will automatically be granted User rights over that file. Group usually contains more than one users. Everyone who belongs to the same user group as User will be automatically the member of Group. You can use Group if you want to assign group permissions to a certain file. For instance, you can allow (or forbid) to the whole group to read, write, or execute a file with just one command. Finally, Other means everyone else who can access the file. Unix treats them as the third kind of owners, and you can set separate permissions for them. Essentially, members of the Other group are users who neither created the file nor belong to the same user group as the person who created the file. Every file on a Unix system comes with three kinds of permissions: Read, Write, and Execute. You can set each kind separately. With the help of these permissions, you can grant or deny reading, writing, and executing rights to the three aforementioned owner types (User, Group, Other). The Read permission grants users the right to open or read a file. The user can only see the contents of the file but cannot modify it. When the Read permission belongs to a directory, the user can only list its contents but cannot modify or delete it. Write allows users to edit the contents of a file. When the Write permission is set on a directory, users can add, rename, and remove all the files residing in the directory. The Execute permission means that a user can run the file as a program. Execute makes sense when you work with an executable file, for instance a script. Unlike Windows, Unix doesn’t allow anyone to run a file as a program unless the Execute permission is set for them. 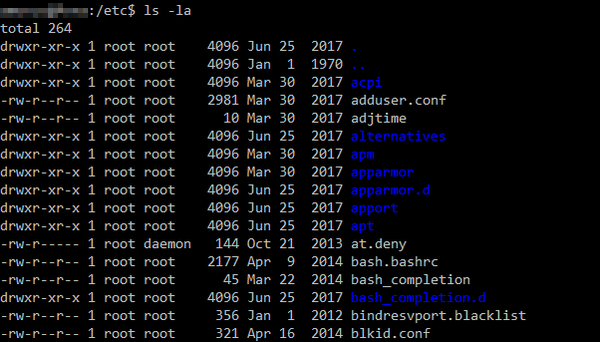 (d) is a directory (directories are also files in Unix). (rwx) User can read, write, and execute the file. (r-x) Group can read and execute the file but cannot read it. (r-x) Other can read and execute the file but cannot read it. Using the same technique, you can decode the file permissions of any Unix file. 444 = Owner can read (4), Group can read (4), Other can read (4) the file. 644 = Owner can read and write (4+2=6), Group can read (4), Other can read (4) the file. 604 = Owner can read and write (4+2=6), Group can do nothing (0), Other can read (4) the file. 777 = Owner can read, write, execute (4+2+1=7), Group can read, write, execute (4+2+1=7), Other can read, write, execute (4+2+1=7). This is the least restrictive permission; it’s considered dangerous by most sysadmins. Using this technique, you can calculate the numeric equivalent of every possible file permission combination. However, there are some combinations that are rarely (or never) used as they make little sense (e.g. 333). Most control management systems (CMS) come with typical file permissions they use on the websites they power. For instance, WordPress uses 755 and 644 across its file system. In the WP Codex, you can read more about WordPress’ file permissions. As I mentioned, WordPress uses 755 and 644 for its core files. On the screenshot above, the file permission for the .htaccess file has been manually changed to 404 as it’s more secure than the original 644. However, a strict permission like that may cause problems on some servers—you need to experiment to see what works for your specific server configuration (if 404 throws an error you can also try 444). Recursive permission change only works on directories. As you can see, Unix is a smart system. If you know the rules you can quickly perform different tasks at the root level, such as improving security. Before you change your file permissions, always think about how it can affect your whole system. If you want to learn more about how you can make your website more secure also take a look at our articles on PHP security measures and the best security plugins for WordPress. To stay updated with the latest web development tips, tricks, and news, don’t hesitate to follow Developer Drive on Facebook and Twitter, either.